The regional Fed indexes, which presaged real strength in the industrial sector over the last year, are faltering (while still positive). Meanwhile housing, as exmplified by purchase mortgage applications, refuses to be held down. Do interest rates still matter for the housing market? In the past few years, the strength of the housing market has seemed to defy the impact of interest rates. Do they still affect housing? I take a detailed look over at XE.com. Higher wage growth for job switchers: more eviden of a taboo against raising wages? Although wages haven't been rising faster for the median individual, they have been for those who switch jobs. 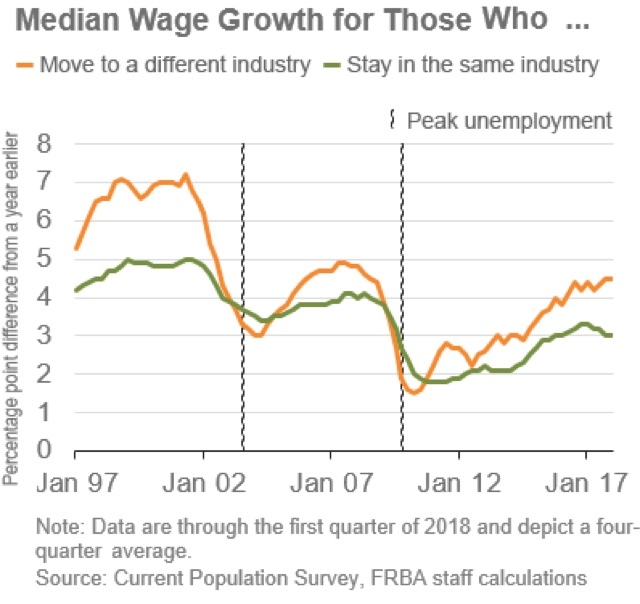 This distinction is important because the wage growth of job-switchers tends to be a better cyclical indicator than overall wage growth. In particular, the median wage growth of people who change industry or occupation tends to rise more rapidly as the labor market tightens. Essentially the Atlanta Fed is highlighting the orange line as a "better cyclical indicator." Is it? There's no doubt that wage growth among job switches declined first in the last two expansions. But I would want to see a much longer record before being that confident. Because what I see in the above graph is a decline among job keepers (the green line) that is only matched by those declines presaging the onset of the last two recessions. Meanwhile the orange line, while still rising, has flattened. In fact I think the Atlanta Fed's graph mainly shows evidence of what I highlighted last week as an emerging "taboo" against raising wages -- i.e., a stubborn refusal to raise wages even if it would lead to even higher output and gross profits for a net gain. Once again the JOLTS data gives us a good proxy. If wage growth is increasing at a "normal" rate compared with previous expansions, there shouldn't be an inordinate need to change jobs in order to get a raise, i.e., a rate higher than previous expansions. Thus the ratio of job changers who quit vs. the number of actual hires should be equivalent to similar stages in those expansions. If, on the other hand, employers have become inordinately stingy, quitting is almost essential to get ahead, in which case the ratio of quits to hires should be higher than normal. For the last several years, Quits have been in the range of 58%-60% of hires, the highest since 2001, and specifically higher than the 56%-58% peak of the last expansion. In other words, it looks like what the Atlanta Fed's graph is showing is that employees are reacting to the taboo against raising wages by quitting their jobs and moving to employers in fields that are already paying more. In January, only the first and last markers were present. Let's update now that the first quarter iv over. Real wage growth is up just barely above zero, at +0.1%. This is only a little over 2% and has been decelerating. Inflation was increasing in January, and has continued to increase since. The bottom line is that, while the economy might feel like it is booming on the production side, it isn't booming at all on the worker/consumer side. First, a quick note on housing permits and starts: obviously the overall numbers were very good. The overall uptrend remains intact, and March was lower than only January for the peak of this expansion for permits. The three month average of the more volatile starts number was the highest so far during this expansion. There is at least one issue which may indicate some stress building in the market -- or might just be noise. Single family permits declined to the lowest level in half a year. Since multiunit housing (condos and apartments) is something of a substitute good, not infrequently that part of the market continues to rise after single family housing has peaked. I plan on a more detailed look tomorrow. Stay tuned. Still, the meme that the "hard" manufacturing numbers haven't followed the "soft" ISM and regional Fed reports (ironically now that the regional Fed numbers are softening) ought to be dead. Since production is the ultimate "nowcast" number, this argues that in Q1 the economy turned in a decent performance. This morning's retail sales report for March was certainly very positive. Nevertheless, there is one aspect of the trend which is a little concerning. This is in line with the general upward trend. Note that I am discounting somewhat the spike last autumn that was probably related to extraordinary hurricane and wildfire repairs. But, in line with the overarching story that we are late in the expansion, is there anything to look out for? Yes. Real spending on vehicles declines below zero YoY well before a recession, while real spending on other things (including necessities like food) may not necessarily turn negative at all, although growth certainly declines. Even with today's good reading, retail sales of motor vehicles and parts was only +0.5% YoY during the first quarter. Since part of Q4 2017's spike was related to flooding in the Houston area, the trend in growth certainly looks to be declining. Although the remaining part of retail spending looks very healthy, should motor vehicle related spending turn negative YoY, that would at least be a cautionary "yellow" flag. A point I have made about economic forecasting a number of times is that one can be an excellent forecaster, so long as one is a bug on the wall. Once a significant number of people begin to follow *and act upon* the forecast, to that extent it must necessarily lose validity. Take for example the yield curve, much in the news this year. So long as everyone ignores or excuses a yield curve inversion, it is an excellent indicator for the period of 12-24 months ahead. But if everyone *acted* on a yield curve inversion, by, e.g., canceling investments or increasing savings, it would turn into a botched "nowcast" instead. That which people might have started doing a year later, they would be doing now, when the conditions don't yet necessitate it. Simply put, people will act upon forecasts. The more previously reliable or certain the forecast, the more people will act on it -- and thereby change the result. It is entirely possible that, because I was making decisions in an environment where Hillary Clinton was sure to be the next president, my concern about making her an illegitimate president by concealing the restarted investigation bore greater weight than it would have it the election appeared closer or if Donald Trump were ahead in all polls. Leave aside for now that it was not for Comey to decide whether or not Clinton would be "an illegitimate president" -- that's what we have criminal juries and Impeachment for -- or that he simultaneously withheld from voters that Trump's campaign was *also* under investigation at the time. The fact is that he was led by polling and poll aggregators who claimed that a Clinton victory was a near certainty to take an action that he probably would not otherwise have done. And that action caused a near-immediate decline in Clinton's poll numbers by about 4%, while early voting was actually going on in many states. All because Comey knew that Clinton's election was "in the bag." In a similar vein, why was Barack Obama so passive in the face of the intelligence community telling him that Russia was trying to intervene in the election by, e.g., planting "fake news" stories? He was President. He did not need Mitch McConnell's permission to address the nation in as non-partisan a fashion as possible. He didn't act because he knew that Clinton's election was "in the bag." Isn't that what Biden was sent to Europe to reassure all of our allies about? There's also been some detailed analysis indicating that there were enough Sanders to Jill Stein voters in Michigan, Wisconsin, and Pennsylvania to swing the outcomes in those States and thereby alter the election outcome. I think it's a near certainty that these people felt comfortable casting such protest votes because they knew that Clinton's election was "in the bag." To paraphrase the title of this post: when you look into the Future, the Future always looks back.